The greatest interest in the global methane budget is in understanding the factors of methane emissions, particularly from biogenic or natural sources. Tropical wetlands are the largest unknown source of methane, they account for three-quarters of the worlds wetland methane emissions. The inaccessibility of these ecosystems means that there is not enough ground-based measurements to model these sources on a regional or global scale. The MOYA project seeks to better quantify methane fluxes in tropical wetlands, and the dependence of fluxes on temperature, precipitation and changes in the water table through airborne sampling (see blog), eddy covariance, chamber studies, isotopic measurements and analysis of historic flux datasets. 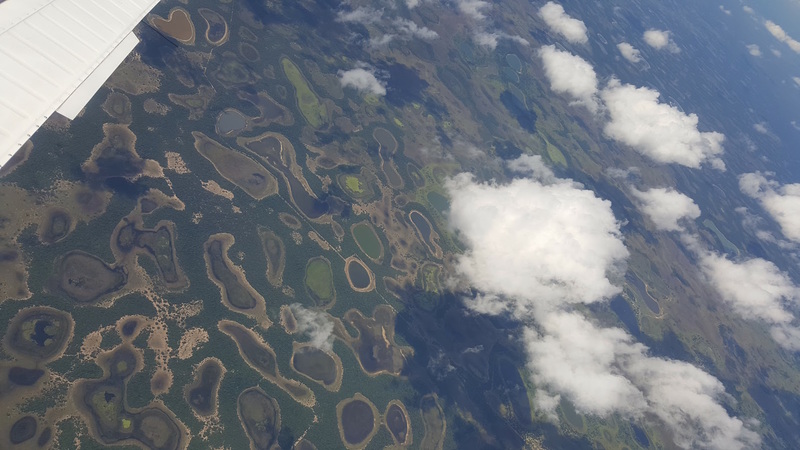 Measurements over the Pantanal area of Brazil were made by the MOYA team: Here’s the blog! The mosaic of circular ponds in the Pantanal, a large expanse of wetland in Brazil.